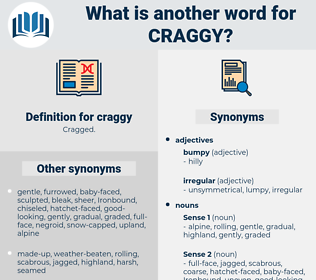 What is another word for craggy? plane, clean, regular, even, level, soft, unbroken, uniform, flush. Waves splinter on craggy rocks and cliffs. Craggy mountains drop almost to the river's edge on one side; on the other, pine woods mask the railway and the hills; while in the distance shine the snow - peaks of the Rockies. 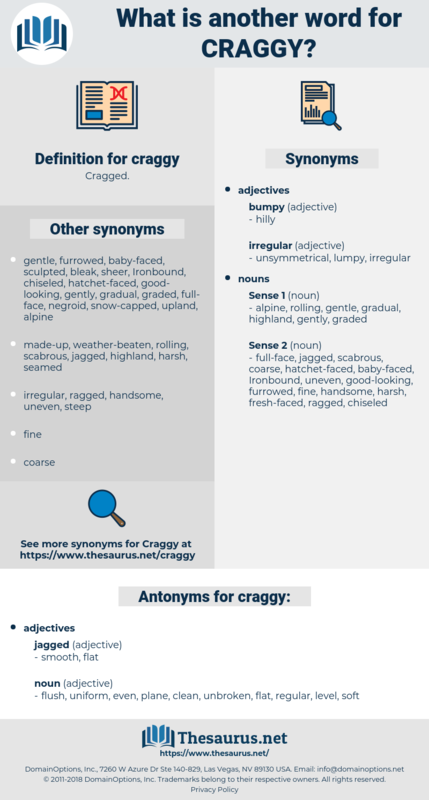 circus, crus, crag, car race, carious, casework, carouse, creak, ceric, crazy, caries, cashier's check, church, curiosa, corixa, cuirass, carrack, crass, cross-check, crossjack, carjack, corse, coerce, crush, cross-eye, carassius, curse, crosscheck, cruse, craigie, choragic, crax, cork oak, corozo, cargo, crius, carsick, course, cirrhosis, crock, correggio, crossway, ceras, currish, cherish, corsica, croak, circe, creaky, cark, cerise, curassow, carcass, cork, cercis, cow shark, crex, curry sauce, carissa, carack, cockroach, cyrus, corky, cerous, Cheshire Cheese, chorizo, cherokee, curious, ceres, coriaceous, Cashier's Cheque, chirk, cockhorse, crash, crease, creek, crack, church key, crake, courageous, circaea, characeae, corgi, coarse, crux, crosswise, corsage, coach horse, cracow, cirrus, caracas, crosse, crisis, carrizo, ceraceous, corokia, choragus, curacao, coryza, crouch, curacy, carex, chirico, corkage, caricaceae, carriage house, casuarius, cirque, cirrhus, carriage, crocus, caruso, curacoa, crick, coracias, choric, crecy, couch grass, cross, carica, Ceruse, croaky, carioca, Caroche, caress, crouse, carcajou, CCRC, Cyrus Ii, creese, chorus, charge, cruise, courage, crook, craze, carcase, cress, cereus, croesus, creashak, carriageway, crossways, creche, checkers, crookes, crazy house.